Some cheeses are prized for their low melting points and elasticity – think fresh mozzarella, gruyere etc. Other cheeses are just as prized for their higher melting point meaning they can be fried without turning into a gloopy mess – think kefalograviera and, of course, haloumi. The Cypriots claim haloumi as their own but it is eaten throughout the Mediterranean and the Middle East. In recent years it has also become popular here in Australia. Traditionally, the cheese was made with sheep or goat’s milk but most of the haloumi we buy here is now made with cow’s milk. When bitten into, haloumi has a slightly squeaky texture that is most distinctive. It is quite salty so no added salt is needed when cooking it. We used ours in this easy salad. Heat a heavy based pan and fry the eggplant and mushrooms until done. Set aside. Cut the haloumi into batons and fry in some more olive oil until lightly golden. Reduce heat and drizzle with the honey, add pistachios and fry for a further minute (be careful as the honey can burn). 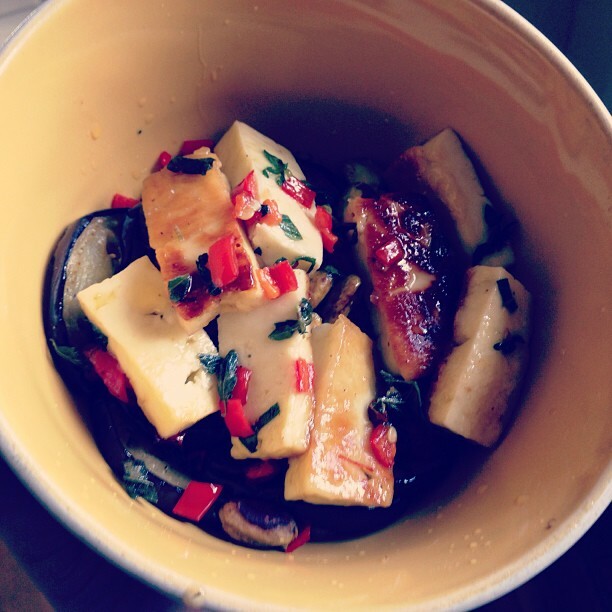 Put some eggplant and mushrooms in the bottom of each bowl, add herbs and chilli. Top with haloumi and pistachios and finish with a squeeze of lemon.